Below the surface of the sea is a special world known only to a few. This is the realm of the Mermaid. Half human in form, she has a long graceful fin instead of legs. The mermaids are very playful and especially fond of young dolphins, whales, and sea turtles. Spending many hours together, they seek adventure, and journey to new places beneath the sea. Many times throughout their day, mermaids always help much of the sea life around them. The crabs and lobsters especially are always getting caught in rocks and seaweeds. Mermaids have beautiful singing voices and love to entertain and fascinate the mermen. It is said that if ever a mortal human hears the mermaids singing they will eternally be drawn back to the sea. They will forever search to find the enchantress and her song again. It is said among those who sail the seas that mermaids were first seen by sailors of pirate ships. In the days of Blackbeard during the 16th century, after a night of indulging in island spirits and gazing into the moonlit ocean around them, they saw beautiful women swimming in the waters just below the surface. Squinting their blurry eyes they were awe stricken when they realized that these seductive creatures had tails like a fish! 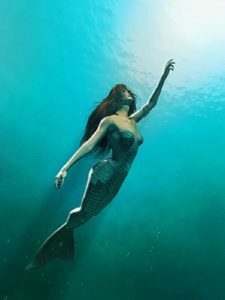 One last thing....it is also said...mermaids are mysterious and alluring...they have captivated us for centuries. These ravishing maidens are beautiful, shameless, seductive, and they are irresistible goddesses of ageless beauty. They are fertility symbols, forbidden lovers, the immaculate of feminine wile and wisdom..a treasure...to the most fortunate men of this landlocked world! Over the generations sailors have shared their stories of these mysterious creatures, and even to this day ships have attached a mermaid figurehead to the ships bow. These figureheads are thought to bring the ship and it’s crew good luck on their voyage. Now, to begin your search for your enchantress, scroll to the top and click on the tab that says "STORE"